If one part hurts, every other part is involved in the hurt, and the healing. I Corinthians 12: 26, The Message. Tragic death. Terror. Devastating loss. Heroic rescue. Miraculous generosity. Recovery. When we watch the news coverage of Hurricane Florence on the Atlantic coast of the United States and Typhoon Mangkhut ravaging the Philippines and Northern Mariana Islands, we feel the hurt, and we see what it takes for healing to begin. In every natural disaster lives unravel in ways that take months or years to put back together. We have neighbors in North Carolina and in the Philippines, who need our love to put their lives back together. And we have United Methodist partners who can carry our love to heal what was broken in these storms. On Sunday, September 23 or 30, please give what you can to put your love to work by giving to the United Methodist Committee on Relief (UMCOR). You can give through your local church by marking a donation to the U.S. Disaster Response fund (#901670) or the International Disaster Response Fund (#982450). 100% of your gift will be used for response work relief with no administrative overhead. Or you can give online at www.umcor.org/donate. You can include your church name when you give so it will be recognized. And as you give, pray for the people whose lives are disrupted and for those who are responding. Also say thanks for the United Methodist connections that give us confidence that our gifts are used wisely, for the purpose given, to benefit all God’s people. This is your HEADS UP! In a couple of weeks I’ll invite United Methodists and friends in the Greater Northwest Area to join a year-long devotional study beginning with Advent 2018. I hope many of you will form small groups to engage in this study together, but individuals can do it on their own. I hope that together we can renew our faith for the challenges we face in our lives, the Church, the nation and the world. In We Make the Road by Walking, Brian McLaren introduces us afresh to the principles of Christian faith and bible teachings. Each week, in 3-4 pages, he invites us to revisit biblical principles and our lives of faith. We’ll create a blog to go alongside the study, with reflections and prayers by leaders of our Conferences, and a place for comments and conversation. Some of you may already have your plans for Advent and beyond. If you can, I hope this Christian practice will fit into your other plans — especially since it will carry through this entire CrossOver Year. The CrossOver Year begins December 2, 2018 and ends November 24, 2019, with the special General Conference in February. I hope this notice is coming early enough that you can start encouraging participation now. Watch for more information in the roll-out of the CrossOver Year — coming soon! Look, I’m sending you as sheep among wolves. Therefore, be wise as snakes and innocent as doves. It’s hard to be a human these days. The images. The stories of children being taken from their parents. They have been burned into our collective consciousness. I want to look away, but I can’t. Love doesn’t let me. I want to do something, but I feel powerless. Does my voice matter? Has the church’s witness eroded so much that it makes very little difference? What are we left with? Only love. The suffering of little children and their parents tugs on my heart and leads me to search for ways to put my love to work. Public policy isn’t all made in Washington D.C. or Salem, Olympia, Boise or Juneau. It is also made when the private love of many spills over into the collective compassion and outrage of a nation and its people. Public safety and national security are not only the responsibility of law enforcement and Homeland Security. They are also our responsibility when systems of authority and power fail. Infants taken from their parents is a matter of public safety. Love has no magic to shake away depraved policy or fix cruel laws. But it is so very powerful. Love is our lifeline to humanity. As your Bishop, I implore you to not look away. Love needs our help. SEE the pain of those at the border, in tents in the desert, behind chain link, and huddled under space blankets. But don’t stop there. If you SEE something SAY something – on Facebook, to a friend or family member. Share what you see and how it looks to you. Ask yourself, WHAT CAN I DO TODAY? Don’t get trapped in believing it has to be something big or that your action needs a certain number of Likes or Re-Tweets to have meaning. Speak to neighbors. Talk about what you see. The collective actions of individuals have drawn attention to this crisis and changed public policy already. Remember that God is with you. Act and speak (and text and Tweet) with confidence, knowing that love is never the wrong answer. Life is complicated and so are the many laws that define how we relate to each other. Be clear about what you know, but also be humble about what you don’t. When I first heard that undocumented immigrants are held at a prison in my neighborhood, I was outraged – 174 women, some who have been separated from their children. I wanted to have my own private protest: make a sign, and go walk up and down the sidewalk. I wanted to write them all letters, saying I’m here, I know you are in there, I’m your neighbor and I care. Earlier this week I attended a community meeting in my neighborhood, where 206 undocumented immigrants are housed in a Federal “Detention” Center 2 ½ miles from my home and from my office. Approximately 300 people turned out. We heard from high school students who live in terror of their parents being deporting leaving them to care for younger siblings. Of one mom arrested by ICE when she responded to a request for an interview, leaving her 3 children without a parent. We listened with love and pledged our love and support to stop family separations. 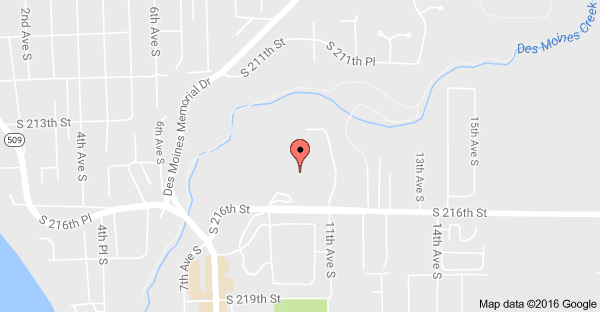 Last night on my way home from the grocery store, I drove to the SeaTac Detention Center. As I came near, I looked at the many levels of narrow windows rising into the blue sky and prayed for the people, whose faces I could not see through those windows. Then I turned into the parking lot, passing signs warning that anyone entering the property could be subject to search. I followed the signs for visitor parking, and drove past three large white buses, with U.S. Government license plates. Later on TV I saw similar buses transporting separated children to detention facilities in Texas. Why did I go there? What difference did it make? I went to SEE the place where my neighbors are living. To IMAGINE their lives. To WONDER if there are separated children in that facility as well as adults. To ASK God what it means to love with my whole heart, soul, strength and mind? And now I’m asking you to engage. LOOK at the children. PRAY for all who flee violence in their homeland, desiring a better life. Look at the facilities where they are being held. If you are flying, NOTICE if there are unaccompanied minors traveling with escorts. LOCATE the nearest detention facility. Notice if buses are coming and going. FIND OUT who is organizing concerned people for public witness and policy advocacy. READ the attached resource from our Board of Church and Society. And WATCH for how to put love into action. I don’t know what my next step is. I’ll talk with others who are already involved. Finally, pace yourselves. While yesterday’s executive order may reverse the most egregious policies, it does not resolve the separations, or the crisis on the border, or the terror people across America live in. We will need the love that never ends. We need to be committed for the long haul. May we be the real, living presence of Christ in the world as we SEE, PRAY, READ, SPEAK and ACT. In response to President Trump’s executive order, the general secretary calls on United Methodists for further action on immigration. Because of persistent public pressure, President Trump signed an executive order Wednesday reversing the administration’s practice of forcibly separating children from their parents. I thank God for the faithful witness of thousands of United Methodists reflecting Christ’s love and compassion into this broken world. This action does not, however, solve the problem. While this executive order ends the practice of family separation, it continues what the administration calls a “zero tolerance” policy. This now means that families seeking refuge in the United States can be held together, in detention, indefinitely. Our United Methodist Social Principles and Resolution #3281 are clear: we support policies that compassionately welcome immigrants and respect their human rights. Policies that jail families — whether separately or together — fail to reflect our shared values of compassion, dignity, justice and love. Our options are not limited to jailing families together or jailing parents and children separately. Alternatives to family detention, such as the Family Case Management Program, have been shown to be compassionate and effective. The administration terminated this program last year and instituted “zero tolerance” policies in its place this year. Children who are detained are compassionately cared for. Families who are separated are reunited. Families will not be held indefinitely. Workers should no longer fear workplace raids disrupting family and community. Survivors of domestic abuse and gang violence have asylum protections reinstated. DACA recipients are cared for through a legislative solution that leads to a pathway to citizenship. The current state of our immigration policies is anything but compassionate and effective. Our Church calls us to welcome the migrant, and we must do that in our churches, communities and governmental systems. Our witness cannot stop now. Tomorrow, my husband Clint and I fly to Alaska for the Alaska Annual Conference in Seward, the first of three in the Greater Northwest in the next few weeks. I invited members at all three Conferences to read The Anatomy of Peace: Resolving the Heart of Conflict. The book was recommended by the Commission on A Way Forward and the Council of Bishops, as a tool to help people know each other at a deeper level, so that they might discover a way to live together peacefully, despite deep difference. As a church, we are seeking a unity that is deeper than our differences. Last summer, during worship at a training event when the leader asked us to “turn to your neighbor” and share, I met United Methodist pastor, coach and trainer, Brian Brown. Brian said he wished that every clergy person was introduced to The Anatomy of Peaceat the beginning of their ministry. I learned that he was a passionate evangelist, and certified teacher of The Anatomy of Peace. I bought the book that day, read it immediately, and later invited Rev. Dr. Brian Brown to teach and lead us into the practices of The Anatomy of Peacefor our annual conference sessions in Oregon-Idaho and Pacific Northwest. Rev. Donna Pritchard will be leading a condensed workshop in Alaska. Last week a controversy erupted over the book, when Rev. Hannah Adair Bonner blogged a provocative critique of The Anatomy of Peace, unmasking issues about its sources that are hidden in shadows. Why is the author listed as the “Arbinger Institute?” Why aren’t they transparent about the authors? Why is it written as if the people and situations are real, when they are fictional? Are a group of mostly white men competent to give advice about how to resolve conflict among people of diverse ethnicities and cultures, some of whom are oppressed by systems of injustice? I asked similar questions in the early 2000s when I first read Leadership and Self Deception, also authored by the Arbinger Institute. I liked the book, but I felt queasy, so I did a little online fishing and discovered that the Arbinger Institute was founded by Terry Warner, a scholar and member of the Church of Latter Day Saints. I used the insights of the book personally, but was reluctant to share it with others, not so much because of its source as the lack of transparency. If there’s nothing to hide – no deception – why not reveal? I’m not going to presume to know the answer, and I’m not going to make excuses for the people who made these decisions. In her blog, Hannah seems to imply that there are original sins of deception and racism that disqualify the book for our use. So, do we reject The Anatomy of Peace? Or, with awareness of its limitations and flaws, is it still a useful tool? Can we use it to invite newer, deeper understandings between people? Does it offer a way for conflicted United Methodists to venture beneath the surface of our set positions, seek a deeper understanding of one another, and explore how we might live together as we continue to journey together toward the fullness of God’s mission? I find the book’s approach useful. Written in a narrative style, The Anatomy of Peace is an easy read and helps me see how, acting from a “heart at war,” I sometimes shut down relationships, or put others in a limiting “box” of my own creation. Instead, it helps me see that I can learn to act with a “heart at peace” to go deeper with a spouse, an undocumented immigrant, a transgender co-worker, or a United Methodist who likes a different style of music, to listen and understand. This kind of curious, humble, respectful conversation is at the core of Christ’s teaching that we should love neighbor as self. And I trust Brian Brown and a host of others who have practiced what The Anatomy of Peace offers and found it to be helpful for individuals who are stuck in conflicted relationships. It’s one way of striving to better love God, and neighbor as self. Frankly, I can’t wait to see United Methodists leaning into a small circle of colleagues, listening, clarifying, and seeking new understanding. We don’t have to love the way the tool was produced, or apply it where it might do harm. But, where two or three are gathered . . . peace can break out. Between last week’s HOSANNA! and Easter’s ALLELUIA! we watch as Jesus walks to his death at the hands of secular and religious authorities, but emerges on the other side, victorious by the power of love at work in the world. If we haven’t already cast the story with bunnies, daffodils and butterflies, we will recognize this story wherever hope breaks forth from despair. In the crowds of young people in the streets of America, marching, pleading, promising to claim their chance to live without the fear of being stalked and killed at school or at home, or in the neighborhood. We will recognize the story among immigrants, who have left everything behind, travelled at great peril across deserts, war zones, oceans, boundaries, to arrive in foreign, often hostile lands in hopes of living in freedom, security and opportunity. We will recognize the story among the poor and homeless who live every day like birds or tiny fur friends in hidden corners, and under bushes, in alleys, behind abandoned walls, in defiance of the powers of death that hem them in before and behind. We will recognize the Jesus story in our own lives every time we break free from habits of thought and practice that do not serve us well – routines, sorrows, low expectations, petty grievances that we give safe harbor, allowing them to dull our senses and lower our gaze. We will recognize Jesus, alive and well every time we hear the unlikely – miraculous story, really – of someone walking out of the valley of the shadow of death into the dazzling light of a new day. You see, the Jesus story isn’t about Jesus, really. His death and resurrection weren’t about him at all. They were about us. They were about God’s magnificent creation, coming out from behind a cloud. Jesus lived and loved and died and rose to open our hearts, our minds and the doors of our small lives to the way God’s love in and through us can make all things new. This is the body of Christ, broken for you. This is the cup of the new covenant, poured out for you and for many. May new hope dawn in your life, in our nation, and on this precious, precarious planet. May a way open that you thought was closed. And may you discover unimagined blessing. So shall we shout, Alleluia! My heart is not at war. I am not using clergy and staff appointments to undermine the unity of the Church or the work of the Commission on a Way Forward. My heart was at peace when I appointed Rev. Kathleen Weber to my cabinet. It was at peace when I approved hiring Rev. Brett Webb-Mitchell by the Oregon-Idaho Annual Conference. These are two deeply faithful, highly qualified, effective leaders, well suited for the ministry contexts they are called to serve. They were not chosen for their sexual orientation. I did not disqualify them because they are honest about their relationships. I’ll admit that I felt defensive when I read your article, “Northwest United Methodist Defiance.”[i] “Poke in the eye,” “overt defiance,” “callous disregard,” “double-barreled assault,” “escalation,” “in your face repudiation.” Why do you think you know my heart? We never had a conversation. Look for the signs of self-justification and blaming. This was easy for me. You took two of my actions out of context, weaponized them with aggressive rhetoric, and lobbed them into the last meeting of the Commission. You misrepresented my motives. You never asked me what I believe, why I believe what I believe or why I lead the way I lead. And you didn’t even have the courtesy to send me your article. I first saw it when a friend forwarded it to me as an email distributed on March 16, 2018, three days before it was available publicly as a blog on the Good News Magazine You aren’t practicing the practices that the Commission recommends. Find an out–of-the box place. There was a time when a colleague lashed out at me in a meeting, accusing me of racism. I broke into tears and retreated from the meeting and the accusation. A friend sought me out, listened to my pain and invited me to be the whole and well person he knew that I could be. My heart returned to peace and I was able to approach the person I had offended, and begin a long slow journey to healing. Ponder the situation anew. What are this person’s challenges, trials, burdens and pains? How am I adding to them? Wow! I only know you as a guy who attacks from a safe distance rather than picking up the phone. Can I cultivate curiosity about what pain you bear? How are your opinions and actions shaped by your love of Jesus? Act upon what I have discovered; do what I think I should do. I think I should not strike back. I should respond with curiosity. Yet, I think I should not remain silent. I invite you to play fair. I invite you to disarm. Despite deep misgivings, I will give you the benefit of my doubt – that you might want our United Methodist Church to be strong into the future and faithful to God’s leading as much as I do. I hope and pray this is true. If it is true, and we are willing, God can teach each of us to love the other as we love ourselves. I invite you to talk with me before you write about me. I invite you to send me a copy of anything you write about me before you send it to your email distribution list or post it on the internet. I will commit to abiding by the same standard in the future. You are meeting with the Commission on a Way Forward as I write. I pray for you, Tom, and for the work of the Commission. I pray for the future of our church, that we will find a way to continue to share the good news of Jesus Christ, even as we continue to seek to understand the fullness of God’s intention for humankind. I hope that, as a member of the Commission, you are leading us in the way the Commission said it would at the beginning. Do you remember? We need a Church that aspires to this vision: one church, a variety of expressions; one body, many parts. In the Northwest we’re cultivating this spirit, in support of the Commission’s work, as we send 50 trained leaders across the area to facilitate Table Talks about the Way Forward between now and June, and dedicate 4 ½ hours during our Annual Conference sessions to The Anatomy of Peace and small group conversations. God is at work when two or three gather. I’m expecting miracles. [i] “Northwest United Methodist Defiance,” by Thomas Lambrecht, circulated by email from ifo@goodnewsmag.org on Friday, March 16, 2018, and posted as personal blog on Monday, March 19, http://tomlambrecht.goodnewsmag.org/northwest-united-methodist-defiance/. [ii] The Anatomy of Peace, resolving the heart of conflict, The Arbinger Institute, Berrett-Koehler Publishers, 2006. Council of Bishops President Bruce R. Ough calls for colleagues to be open to changing their minds under the influence of the Holy Spirit. Ough preached during the Feb. 25 opening worship service of a council meeting that goes through Feb. 28, in Dallas. Yesterday Bishop Bruce Ough led us back to a principle that has guided Methodism throughout our history: God always leads Christians into ministry on the margins with the poor and outcast. 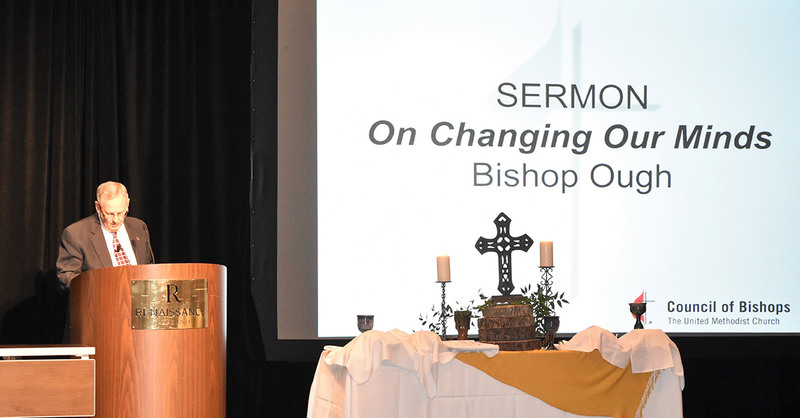 As the Council of Bishops meets to receive and consider the report of the Commission on the Way Forward, receive Bishop Ough’s sermon as a message of courage and hope for the whole Church. Please hold us in prayer, as we seek to lead the church on a path of faithfulness and obedience to God. 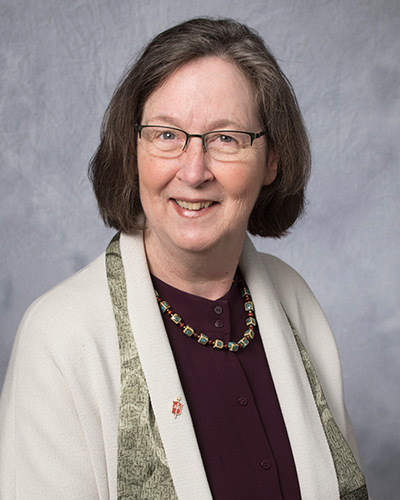 Friday, nearly 50 leaders from the Alaska, Oregon-Idaho and Pacific Northwest Conferences will gather to be equipped to lead “Table Talks” across the area where United Methodists can seek unity in the church that is deeper than our different understandings and attitudes about human sexuality. The differences are undeniable. They have strained the Church for more than 40 years. In these conversations we hope to understand what informs our differences from one another, so that we can respect one another, learn from one another, and continue to be members of one, undivided Church as we continue to listen to God’s leading through these differences. The Table Talks will occur throughout the spring. I hope to see you there, to hear your voice, and to prayerfully, in the presence of the Holy Spirit, see the ways to live together in peace. This is powerful, difficult spiritual work — worthy of the sober self-reflection of Lent. Any time we pause, turn to one another and God, and pray, we live in the promise of new life, revealed in the resurrection of Jesus Christ. I pray that as we gather, humbly and prayerfully, there will be enough light to show us the way.